As a mom, I want to spend quality time with my kids without going into debt (have you seen the cost of a movie theater ticket?!). We love to travel, but in-between trips we also like to have fun and enjoy our hometown. One way I try to minimize the costs is by focusing on things that don’t require a lot of money. I find that the simplest activities can be the best ways to enjoy time with our loved ones. This summer, I want to encourage you to put your wallet away and get creative. To help you get started, here are 9 activities you can do for practically nothing while creating memories with your family. Let the kids pick a movie, grab a few snacks and popcorn. You can borrow a movie from your local library, your own family collection, movie swap with a friend or join an inexpensive movie rental service like DVD.com.
. Some of our fondest memories have happened during family game night. This is one of my favorites. We get to talk, enjoy the neighborhood and even get a small workout. It’s also a great way to get your children to open up and chat (at least mine do). If you want to make it a bit more fun, drive to a local park and find a trail. This takes it up a notch for my kids since they feel like we’re on an adventure. My family really enjoys going to our local bookstore. They have a coffee shop, so we always order a drink, get at a table and read our favorite magazines. It also gives my husband and I time to chat and catch up with each other. You could also do this at your local library. I personally like to talk, so a bookstore makes more sense for me. This is also a great way to enjoy time with each other while helping those in need. This can include, donating clothes, toys, food or volunteering at a local organization. There are many ways to involve children in the process, even younger ones can help sort through donation items. My daughter and I have volunteered our time to help clean apartments for the elderly. Not only did we spend time together, but we did something we both enjoyed – helping our community. If your children enjoy a sport, don’t just sit there and watch, join them! My 10-year-old son enjoys playing basketball so when my husband takes him to the park to practice, we all tag along. We involve all of the kids and give all of them a chance to play. It’s a good time for everyone and my little guy also gets to practice. This can be any venue your family enjoys. Our family likes bowling, go-cart racing, miniature golf and laser tag. Always look for family specials or coupons to keep costs down. There are also many activities that don’t cost a thing such as local parks, free museums, and local sporting events. Sounds simple, but many families are often too busy to sit down and have a meal together. We try to do this as often as possible and we love it. We have the kids sit down for dinner with zero electronics nor anything else that can be distracting. We often stay at the table long after the meal is done, talking, laughing and simply enjoying our time together. Kids love creating things, so why not work on a craft together! There are so many craft ideas online that you’ll likely never run out of ideas. If you’re on Pinterest, check out my Fun Activities for Kids board which is filled with tons of ideas for kids of all ages! 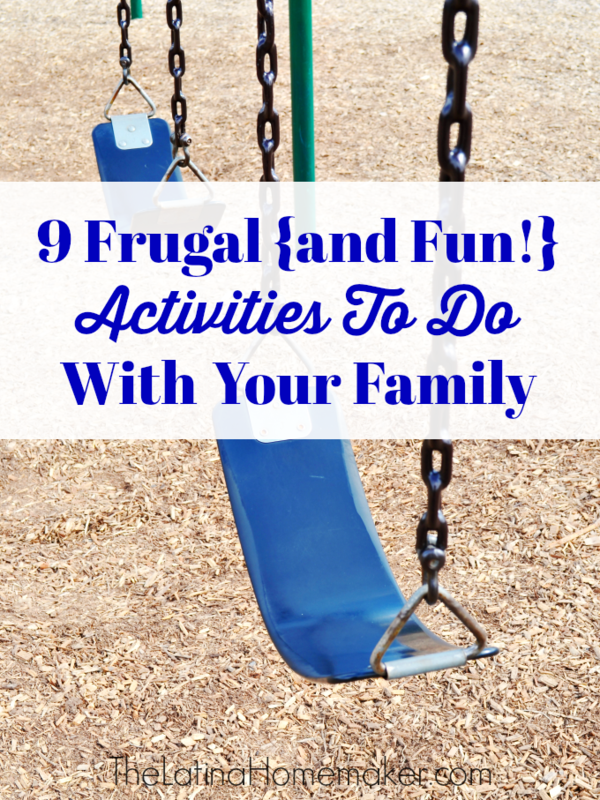 What does your family enjoy doing together that is either free or inexpensive? I would love to hear from you! These are great ideas! I love going to bookstores with the kids.. it helps to foster their love of reading which is something we can share together.